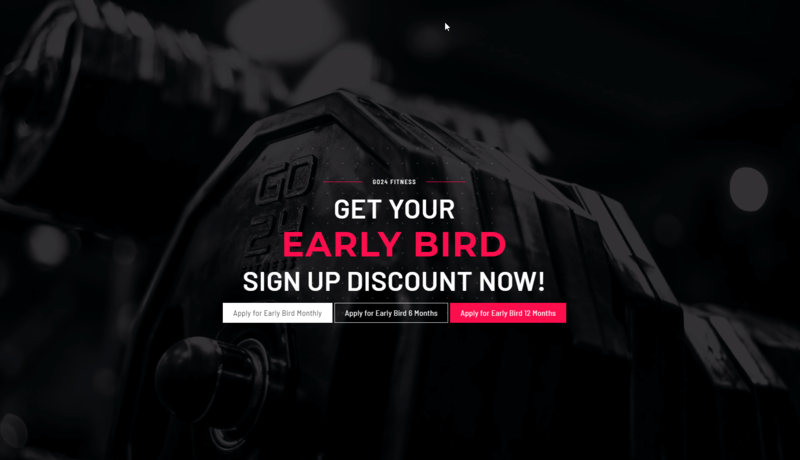 At Roojai Website Solutions, we love working with gyms and fitness centres. 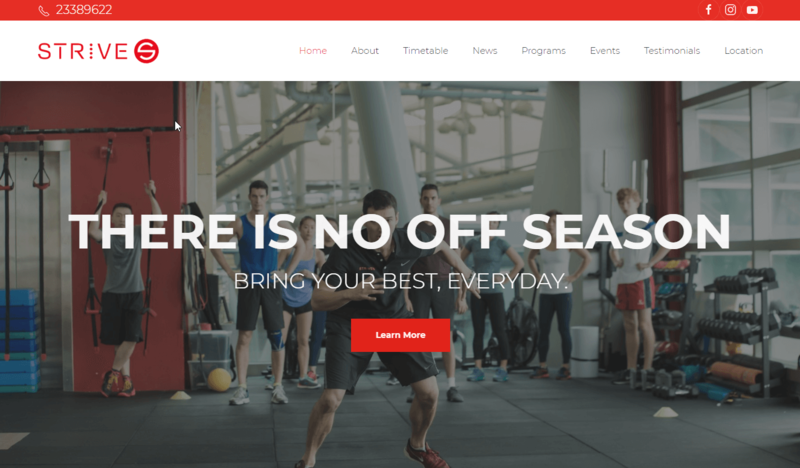 In May we launched a new website for GO24 Fitness, and it joins uTime Fitness Studios and Strive Fitness as another great looking fitness website in our rapidly growing portfolio. We've always had strong links with the fitness and health industry in Hong Kong and so it's not surprising that we have a number of fitness clubs and health centres in our Portfolio. The latest addition to our portfolio is GO24 Fitness which is a brand new hi-tech gym with its first location in Tsuen Wan. We developed a design and layout in accordance with their brand guidelines that utilised some great imagery and the results speak for themselves! The site generates an air of determination, reflects the slick and high-tech layout of the gyms and is popping with clear calls to action. The initial launch is in English but we'll be adding the Chinese version very soon! One of the stand-out features of the site is the Google Walkthrough, a system that utilises the same features and technology of Google maps, but inside facilities instead of out on the street! And a big bonus of using this system is that its integration with Google's business locations systems and is, therefore, awesome for search engine optimisation. We think this feature will become more and more expected by potential customers browsing online for a gym, so GO24 Fitness is well ahead of the competition here! 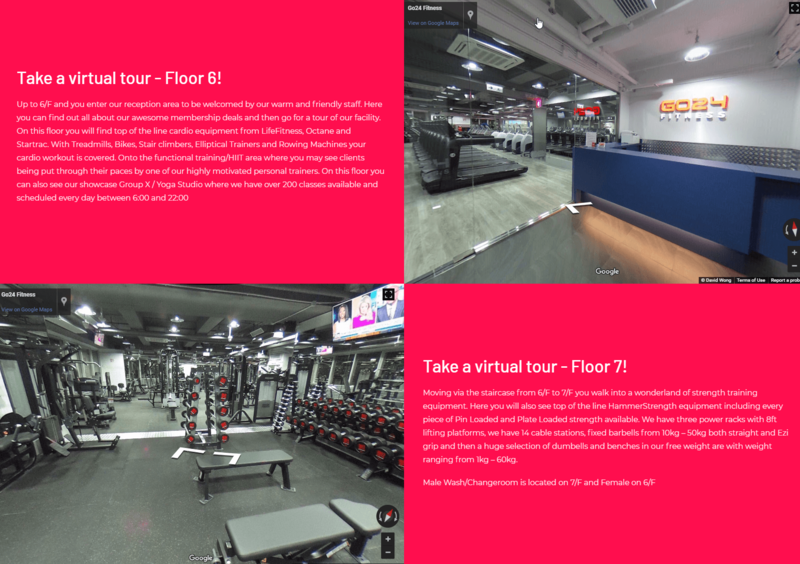 Google's "walkthrough" - awesome for clients to preview the gym, and great for search engines too! Strive Fitness is located at Cyberport and caters to a full range of customers from professional sports teams to people that are on their first steps to a healthier life. They asked us to redesign their website which was outdated and difficult to maintain and we launched a brand new site for them earlier in May. One of the primary goals for Strive was to generate a lot of dynamic content and grow their audience, so we incorporated easy-to-maintain blogs and event systems. The site is built on our "BigFish" platform so its super-fast to load and maximised for search engine ranking. The website generates a personal, friendly and approachable impression. 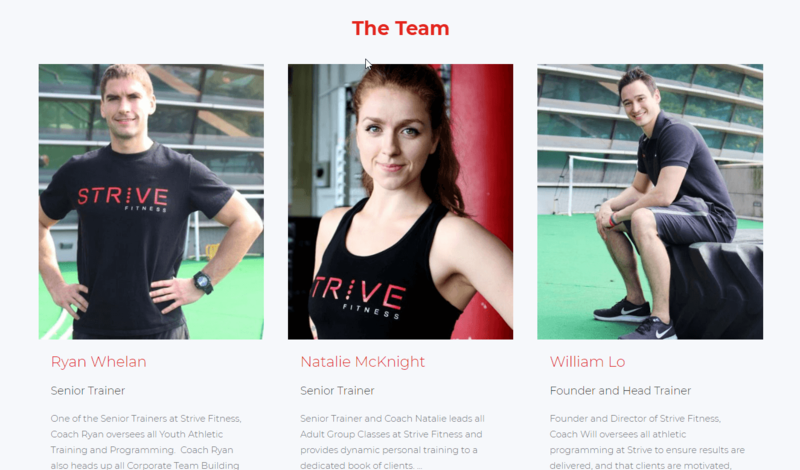 Modern marketing is all about building relationships and growing an audience through the production of content, and we look forward to seeing the online presence of Strive Fitness grow as they begin to add more news, events and testimonials. We carried out a full website redesign and rebuild for uTime in 2017 and the site is still looking very fresh and modern. 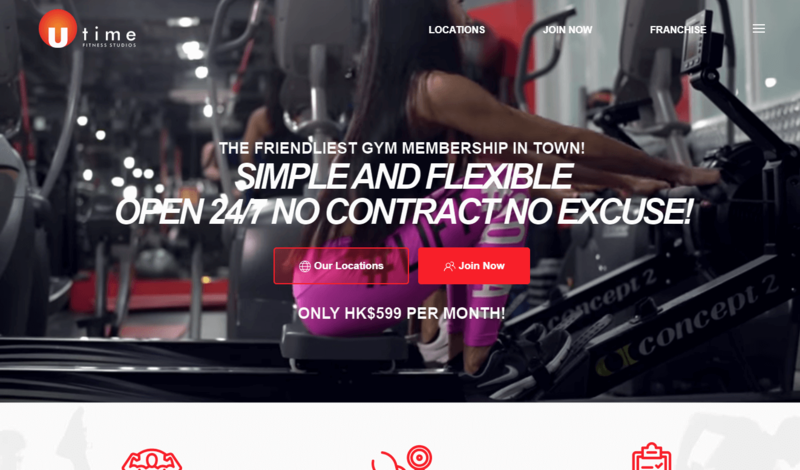 uTime features a number of gyms located in Hong Kong and they are currently expanding into Thailand so we are building new location pages presently. 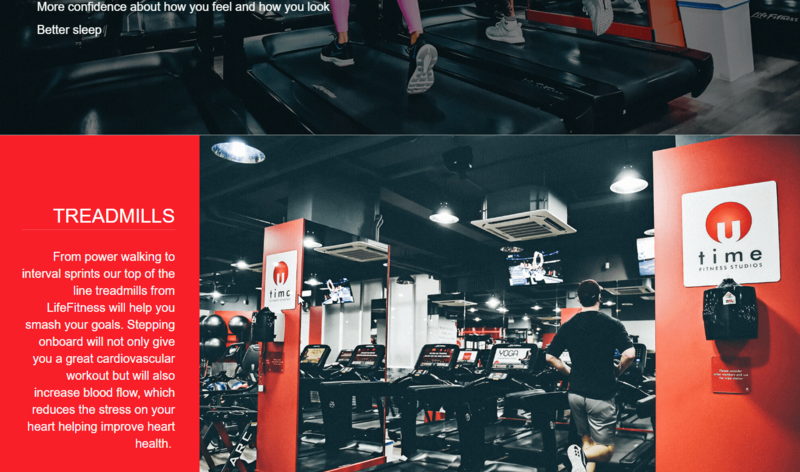 This website features a background video on the homepage which provides an immediate impression of action, effectively displays the gyms, staff and clients. When using videos on a website this way, we need to carefully balance the advantages with disadvantages due to slower page loading times. The video feature is automatically turned off on mobile devices to provide a better user experience and reduce loading times for those on a cellular network. The menu used for uTime is very simple, keeping the initial choices for the visitors to a minimum and therefore focusing the attention on to the key pages. A mobile style menu icon provides many more options for visitors and there is plenty of detailed content once visitors dive in, which is very important for search engine results too. All 3 of these fitness centres and their websites are integrated with MINDBODY, the market leader for gym subscription management. This system offers great tools for marketing and business management software and includes apps that customers can use to manage their class bookings and schedules easily.